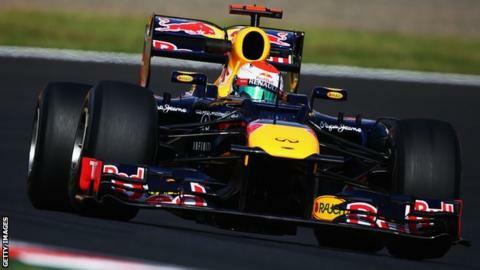 Red Bull's Sebastian Vettel and Mark Webber set the pace in final practice for the Japanese Grand Prix. Vettel was 0.235secs clear of his team-mate and more than 0.6secs clear of the field. Ferrari's Felipe Massa was third from Mercedes' Michael Schumacher. McLaren drivers Jenson Button and Lewis Hamilton were eighth and 13th but their laps were compromised by traffic. World championship leader Fernando Alonso was only 11th and appeared to be struggling for pace. These are worrying times for the Spaniard, who has looked uncompetitive all weekend. He was 0.360secs slower than Massa and on Friday Ferrari admitted that problems with their wind tunnel meant they were struggling to developing the car. McLaren's problems were more superficial - both Hamilton and Button were badly baulked on their fastest laps on the quicker 'soft' tyre by slower cars. Hamilton narrowly avoided what would have been a terrifying accident when he came across Marussia's Charles Pic dawdling on the line on the approach to the chicane when Hamilton was approaching at 200mph. And Button gesticulated angrily at Schumacher after the German, on a slow lap, failed to get out of his way through the flat-out 200mph 130R corner just before the chicane. Although the McLarens look like being Red Bull's closest challengers in qualifying, which starts at 06:00 BST, they were still markedly slower than Vettel when the drivers did their runs on the more durable 'hard' tyre earlier in the session. The world champion set a time more than half a second quicker than Hamilton could manage, although that was later in the session when the track was quicker. Even so, Vettel was 0.300secs faster when he was out at more or less the same time as Hamilton. It was an incident-packed session at one of the sport's most demanding tracks. A number of drivers hit trouble at the tricky, technical Degner corners, which often catch drivers out. HRT's Narain Karthikeyan, Sauber's Kamui Kobayashi and Caterham's Heikki Kovalainen all ran wide and managed to rejoin the track before Force India's Nico Hulkenberg crashed at Degner Two. The German had a big snap of oversteer at the apex of the corner and crashed side-on into the barriers. BBC F1 technical analyst Gary Anderson said: "That wasn't the kind of accident I would expect Nico Hulkenberg to have. He either had a massive oversteer in the corner or something broke on the rear of the car. "When he put the steering back on, it just bit and turned left on him. I wouldn't be surprised to find something had broke on him." Third practice 02:55 BST; 5 live Sports Extra and live text online. Qualifying 05:55 BST; 5 live Sports Extra and live text commentary online. Highlights on BBC One 13:00 BST.